A specific targeted research project funded by the sixth framework program of the European Commission. Cardiovascular disease, mainly caused by atherosclerosis, is the main cause of death in the Western world and also increasingly in developing countries. Even though progress has been made in prevention of the disease, the inflammatory and immunological nature of atherosclerosis is not reflected by available diagnostic measures. Furthermore, treatment has been improved by lipid lowering drugs, e.g. statins, but novel treatment modalities aiming at the pathological inflammatory and immune reactions characterizing atherosclerosis are yet to be developed. Likewise, the understanding of the mechanisms leading to atherosclerosis and causing the immune reactions is poorly characterized. This applies to the general population but also to systemic lupus erythematosus (SLE), an autoimmune disease where the risk of cardiovascular disease (CVD) is very high. Atherosclerosis, the major cause of CVD, is an inflammatory disease where the immune system plays an important role. Autoantibodies as protection or risk markers and therapy through immunomodulation could be a major advance in prevention and treatment of CVD and is a focus of this project. One type of antibodies is natural antibodies against phosphorylcholine (anti-PC), an antigen exposed in some bacteria and in phospholipids with platelet activating factor (PAF)-activity, e.g. in oxidized LDL. Our clinical and experimental studies indicate that anti-PC, mainly of IgM type are protection factors against human atherosclerosis and CVD. Our plan is therefore to develop anti-PC as a diagnostic tool, which will be tested in several unique cohorts, including healthy individuals and high risk individuals. We also believe that anti-PC could represent a novel therapeutic modality, where both polyclonal and monoclonal anti-PC are possible candidates, non-mutually exclusive. Both kinds of anti-PC will be developed and tested in mouse models for atherosclerosis. In contrast to natural antibodies (which are germ line encoded), antiphospholipid antibodies (aPL) are risk markers for both arterial and venous thrombosis, and our main focus is on novel types of aPL against platelet activating factor (PAF) or PAF-like lipids (aPAF). The antigens that aPL in general recognize has been debated, and different possibilities exist, including plasma proteins like 2-glycoprotein-1 but also oxidized forms of PL. Development of assays for aPL and for aPAF and related antibodies is therefore a challenge. These novel risk markers (aPAF) will be tested in the same cohorts as anti-PC and in both cases, diagnostic kits will be developed. The genetic background of anti-PC and aPAF will be studied, e.g. in the Swedish Twin Registry. In a prototypic autoimmune disease, SLE, where the risk of CVD is very high such aPL are raised. Annexin A5 is a plasma protein, interfering with phospholipid surfaces and acting as an anticoagulant. We have demonstrated that aPL inhibit Annexin A5 binding to endothelium, an effect neutralized by intravenous immunoglobulins (IVIG) and that Annexin A5 is present in atherosclerotic lesions especially at sites prone to rupture. Based on our findings, we have hypothesized that raising Annexin A5 binding, either by administration of neutralizing antibodies from IVIG in individuals with high aPL levels, or by administration of Annexin A5 per se, could prevent plaque rupture and atherothrombosis. Taken together, our project combines diagnostic and therapeutic projects and is focused on the role of the immune system, especially autoantibodies, in atherosclerosis and atherothrombosis. Development of robust and quantitative test kits in ELISA format for analysis of IgM anti-PC and IgG antibodies to PAF or PAF-like lipids in serum. Epidemiological data on anti-PC and aPAF from several well characterized and in some cases unique cohorts of healthy and high-risk individuals. Assessment of genetic variability of anti-PC and aPAF and identification of candidate genes. Establishment of in vitro and in vivo models for studies of anti-PC and Annexin A5 relating to atherosclerosis and atherothrombosis. In vivo data for drug candidates for atherosclerosis and atherothrombosis and data compiled to submit an IND application from one of the drug candidates investigated in the project. We expect our novel protection and risk markers to reflect inflammatory and immunological factors in plaques and to be useful as tools for risk assessment for CVD, as a complement to classical risk factors as dyslipidemia, hypertension, diabetes and smoking. We also propose that treatment relating to these factors could be a major step forward in addition to established ones as lipid lowering drugs. CVDImmune is funded by the European Union's Sixth Framework Programme (FP6). The FPs are the European Union's key instrument for funding of research in Europe and these programmes have been employed since 1984. The aim of FP6 is to increase scientific excellence, competitiveness and innovation in Europe through better cooperation and coordination, and thereby form a true "European Research Area" (ERA). The FP6 consists of seven thematic priorities where CVDImmune belongs to the priority area "Life science, genomics and biotechnology for health". Within FP6, there are several different project types. CVDImmune is a specific targeted research or innovation project (STREP), which means that the project is a multipartner research, demonstration or innovation project. The purpose of STREP is to support research, technological advance and demonstration or innovation activities of a more limited scope and ambition, principally for smaller research actors and participants from candidate countries. 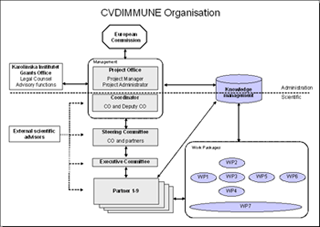 The project management of CVDImmune is divided into a scientific and administrative section, respectively. The scientific section is under the responsibility of the coordinator and the Steering Committee, whereas the administrative section is handled by the project office. 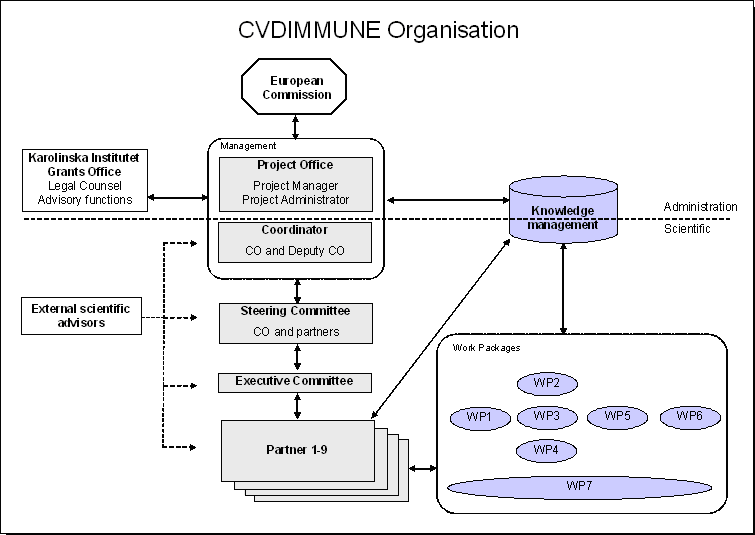 The picture below illustrates the organisation of CVDImmune. Click it to view it in full size. Clinical data indicate that anti-PC of IgM type protects against atherosclerosis and CVD, whereas thrombogenic aPL (e.g. antibodies against PAF or PAF-like lipids) are risk markers for disease. A robust and quantitative ELISA kit for analyses of IgM antibodies against PC will therefore be produced and verified for clinical usefulness to predict CVD. Further, clinically relevant PAF or PAF-like antigens will be developed with the objective to produce robust and quantitative test kits in ELISA format for analysis of IgG/IgM antibodies to PAF or PAF-like lipids in patient sera. Test development of diagnostic tests is divided into three major phases, Prestudy, Feasibility and Production. The release from one phase to the next is preceded by Design review and decision points according to Design control. The documentation in all three phases is governed by GLP, GMP and QSR to comply with regulatory requirements. We will assess the power of anti-PC and aPAF to predict the relative risk of CVD in healthy individuals. For this purpose, three epidemiological cohorts will be used: 1) Representative 60-year-old men and women from Stockholm County initially screened in 1997-98, and now followed for cardiovascular events; 2) Representative age-cohorts of middle-aged men and women, from Vsterbotten County in Northern Sweden included in the MONICA cohort, screened from 1985 to 2000 and then followed for myocardial infarction; 3) A representative cohort of men and women, recruited to participate in the vascular sub study of Malm Diet and Cancer Study 1991-1994, and now followed for cardiovascular events. In addition, the power of anti-PC and aPAF to predict the relative risk for CVD in high-risk individuals, including hypertensive patients, SLE-patients and patients with unstable and stable angina, will be investigated. A Swedish subset of 240 hypertensive patients will be used to assess the antibody levels over a follow-up period of four years. To test the influence of anti-PC and aPAF on the risk for CVD in SLE-patients, a clinical cohort of approximately 200 SLE-patients from Karolinska University Hospital, Huddinge will be utilized. In addition, this cohort will be used to evaluate how aPL and decreased Annexin V binding can influence the excessive risk of CVD in SLE. To further evaluate the predictive power of anti-PC and aPAF in high risk individuals, a clinical material of 1700 consecutive patients (men and women), admitted for acute coronary syndrome to Sahlgrenska Hospital in Gteborg in 1990-1994, will be tested. We also have access to the MORGAM cohorts consisting of a large number of cohorts primarily included in the WHO Monica project but recently also non-MONICA cohorts. The levels of anti-PC and aPAF on frozen serum samples derived from a cohort of about 2000 patients from Mainz will be analyzed. These patients suffer either from stable angina or acute coronary syndrome. To assess the role of anti-PC and aPAF in monitoring the efficacy of preventive actions with atorvastatin and antihypertensive treatment in hypertensive patients (the Anglo-Scandinavian Cardiac Outcomes Trial (ASCOT)). The ASCOT-trial consists of more than 19 000 hypertensive patients (men and women 40-79 years) with at least three other cardiovascular risk factors. These patients were randomized to one of two antihypertensive treatments (amlodipine-based or atenolol-based) using a Prospective Open Blinded Endpoints (PROBE) design. For antihypertensive treatment, amlodipine-based treatment prevented more major cardiovascular events than atenolol-based treatment. In addition, by way of a two-by-two factorial design, a double blind randomized comparison of the cardiovascular effects of 10 mg atorvastatin, a statin, compared to placebo was performed among 10 305 patients with total cholesterol of 6.5 mmol/l or less. As low levels of anti-PC and high levels of aPAF seem to predict atherosclerosis progression in hypertensive patients, we want to evaluate whether these markers could further help to monitor the efficacy of antihypertensive treatment. The hypothesis is that long-term blood pressure lowering might be particularly efficient in case of an enhanced vascular immunoreactivity/inflammation as assessed by anti-PC and/or aPAF determinations. Similarly, we will also evaluate if anti-PC and/or aPAF levels could further predict the outcome of atorvastatin treatment by performing analyses of the lipid-lowering arm of the ASCOT trial. As the relative contribution of genetic and environmental factors for the variations of anti-PC and aPAF are largely unknown, this work package aims at characterizing the genetic and environmental effects behind these alterations. This will also be performed in relation to Annexin V-related measurements and aPL in general. The identification of the genetic basis of the variations of anti-PC and aPAF will lead to an increased understanding of the pathogenic pathways. Genetic and environmental influences on the levels of anti-PC and aPAF will be explored in subpopulations of the Swedish Twin Registry, in patients with SLE and in the cohort of 60- year olds (delineated in work package 2). In the first step about 800 unique twin pairs will be used for quantitative genetic analyses of anti-PC and aPAF, providing estimates of both the genetic influences (heritabilities) and shared and non-shared environmental influences on the phenotypic variances in men and women at various ages. For linkage studies, DNA will be available from the ongoing large-scale study TwinGene where 500 of DZ pairs have been subjected to a 1000 marker (3.5 cM) genome scan. This data can be used for testing for linkage and associations to disease and intermediate phenotypes. Associations to candidate genes will be attained through analysis of candidate genes potentially involved in the pathogenic process or identified through the genome wide scans which are under way on the selected group of individuals described above. In addition, data from a genome scan in patients with SLE with 100k Affymetrix chip array is available and genome scan analysis in the Swedish Twin Registry is also under way independent of this project. The data will be analyzed for phenotypes such as aPAF, Annexin V binding and anti-PC IgM in order to identify new candidate genes. The role of innate immunity, natural autoantibodies and antiphosholipid antibodies in atherosclerosis and CVD, and the possibility of immunomodulation by use of novel therapeutic principles is the major focus this work package. In various in vitro models, we will investigate the regulation and activation of human B cells that produce natural anti-PC and the effects of anti-PC on lipid uptake and activation of monocytes/macrophages and endothelial cells, respectively. The in vitro models include assays testing the effect of anti-PC on the uptake of oxLDL in macrophages and monocytic cell lines, and delineation of specific uptake mechanisms and analysis of scavenger receptor engagement. Another in vitro model is to study inhibitory effects of anti-PC on the activation of endothelial cells, including production of major cytokines, expression of adhesion molecules and induction of thrombogenic microparticles. Enzymes, such as PAF-AH, that relate to the phospholipids studied will be tested for their role in promoting atherosclerosis and CVD, especially in SLE. Another aim of this work package is to investigate how anti-PC and Annexin V can influence atherosclerosis development in animal models. We also attempt to characterize decreased Annexin V binding to endothelium in relation to antiphospholipid antibodies and infection-related antibodies in plaque rupture and atherothrombosis in SLE and in CVD in general. The first aim of this work package is to establish in vitro and in vivo models for effect evaluation of our drug candidates, anti-PC and Annexin V. In vitro models for studying the effect of our candidates are accessible but not validated. The "tool-box" regarding relevant in vitro models will be expanded by use of models at contract research organizations and/or collaboration with academic institutions, preferably in Europe. The relevance of using in vivo atherosclerosis models, such as the Apo*E3Leiden transgenic mouse established at TNO and other models in use at Karolinska Institutet, will be confirmed. In addition, a prototype in vivo model for atherothrombosis created at TNO will be further developed and validated by TNO. The drug candidates will subsequently be evaluated and selected from an effect perspective by use of the models described above. Based on the effect data, we plan to select one candidate drug from either the atherosclerosis or the atherothrombosis studies for further chemical manufacturing control, preclinical development work and compilation of documents for the IND application, excluding the safety, which will be performed and financed outside the CVDImmune project. To provide efficient management and administration of the project, while fulfilling all legal and EC requirements. To establish a functional management structure to ensure efficient communication between the participants in the project. To establish a robust management component to efficiently communicate with the EC. To provide assistance and advice to the project partners regarding administration and reporting. To identify potential problems at an early stage and provide timely and effective solutions. Develop and implement a review and assessment structure to monitor project results with respect to objectives and report findings to the Steering Committee. Decisions and requirements of local ethical committees. The Amsterdam protocol on animal protection and welfare. The Helsinki Declaration and its amendments. The Convention of the Council of Europe on Human Rights and Biomedicine (Oviedo, April 1997).Universal Declaration on the Human Genome and Human Rights adopted by UNESCO, 1997. Our coordinator, Professor Johan Frostegård, will ensure that all applications for approval are sought, awarded and kept on file. Each researcher within CVDImmune will be informed of the ethical requirements of CVDImmune and will be trained to follow such experimental requirements. A gender action plan has been developed within CVDImmmune to increase the participation of women, both at the project level and at the partner level. The aim is that at least 40% of the participants in CVDImmune are women. When publishing job vacancies in the project, women will be urged to apply, especially in fields where males usually dominate. The opportunity for parental leave will be offered. Mentorship programmes, especially for young women in the project, will be started. The Junior Faculty at the Karolinska Institutet offers such programmes. Positively encourage women to become involved in management roles in the Consortium. At Consortium conferences, the number of sessions chaired by women should equal the numbers chaired by men. Female scientists should be encouraged to be responsible for dissemination of results and in communication activities. Encourage each partner to have Equal Opportunity Policies and to follow those. Those partners who do not have Equal Opportunity policies will be encouraged to produce them. During the course and in the end of the project, gender statistics on the project workforces will be collected and evaluated. Website created by Joakim Frostegård. Valid XHTML 1.0 Strict and CSS.